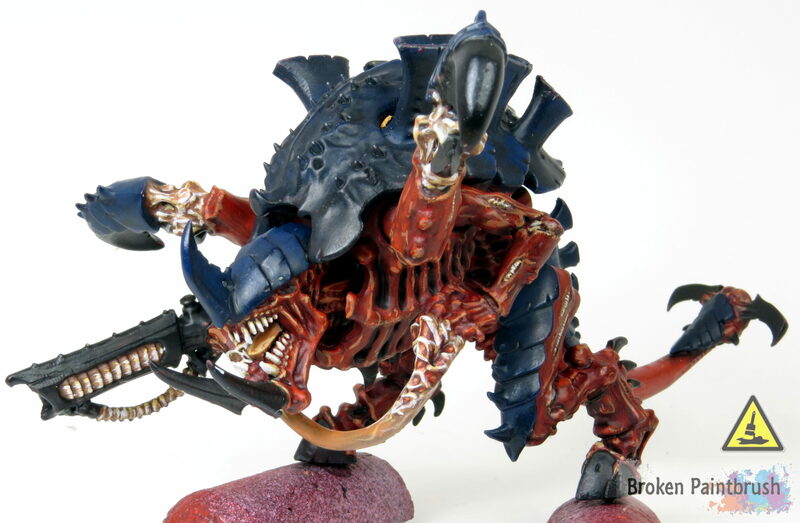 I have put together my step-by-step tutorial on How To Paint a Carnifex, in my case one of Hive Fleet Behemoth. For the finished gallery, check out the post here. 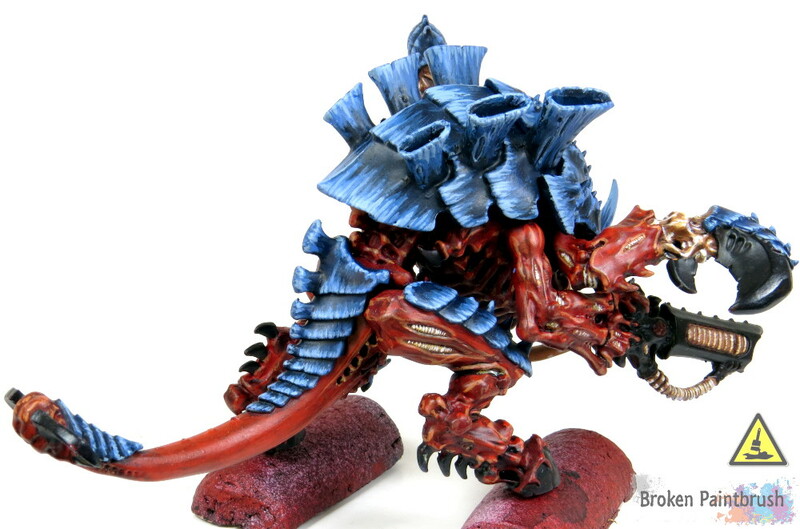 This Behemoth painting guide would be helpful for any Tyranid monstrous creature. I’ve gone back and forth on my projects between black primer, white primer, and even tried brown. What I have settled on is a good black coat with an upper dusting of white. This leaves all the recesses dark (which helps with painting those pesky nooks) but provides a subtle shadow/highlight to the base coats. The dusting also emphasizes the details which make it easier to apply the base colors. 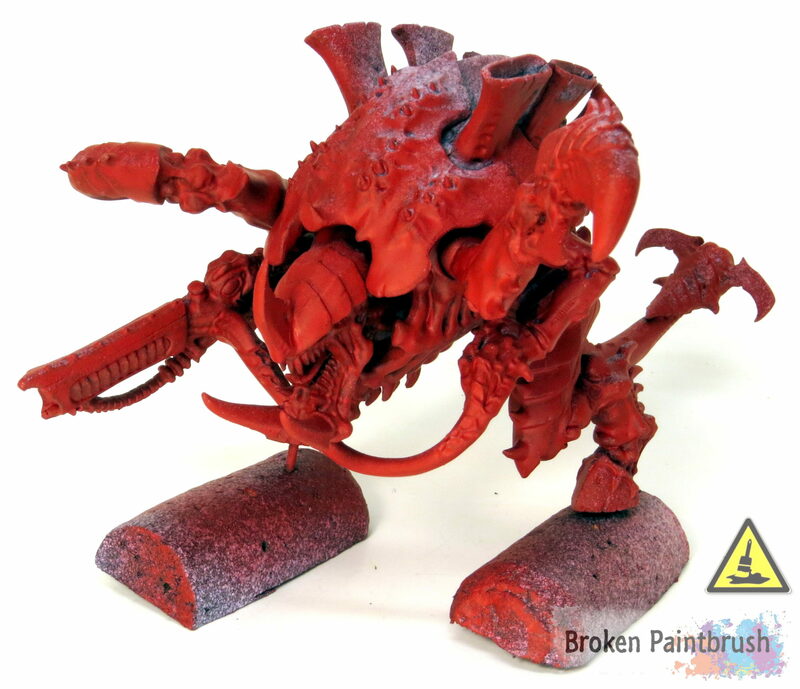 For the Tyranids, I used my spray gun to give a nice coverage of Mephiston Red to all the skin areas. This saves a lot of time not having to paint them by hand. 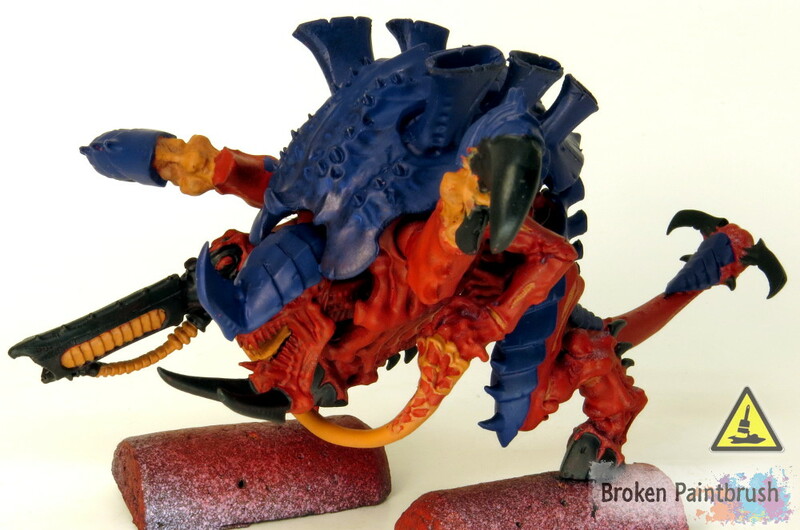 I also chose red over the base blue of the carapace because the blue covers red much easier than red trying to cover blue – something to do with the pigments. The next step is to go back with the brush and block in the rest of the primary colors. 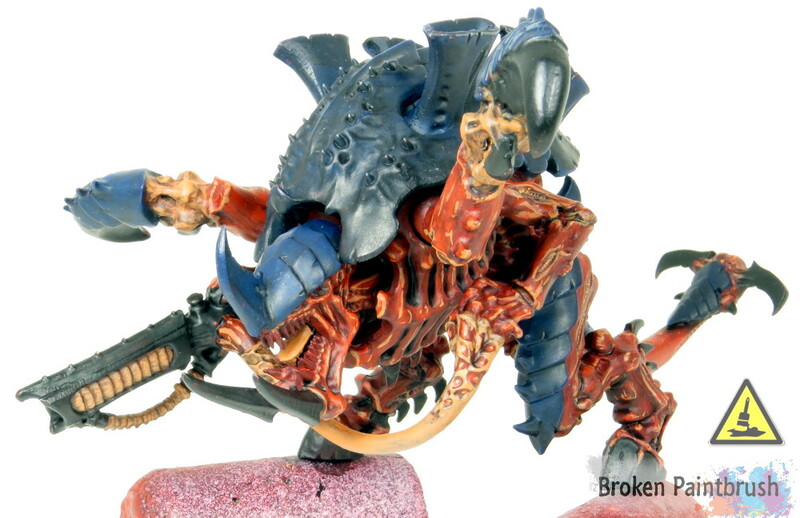 Here I used Necron Abyss for the blue, Abaddon Black for the black, and Ratskin Flesh for the non-red flesh. 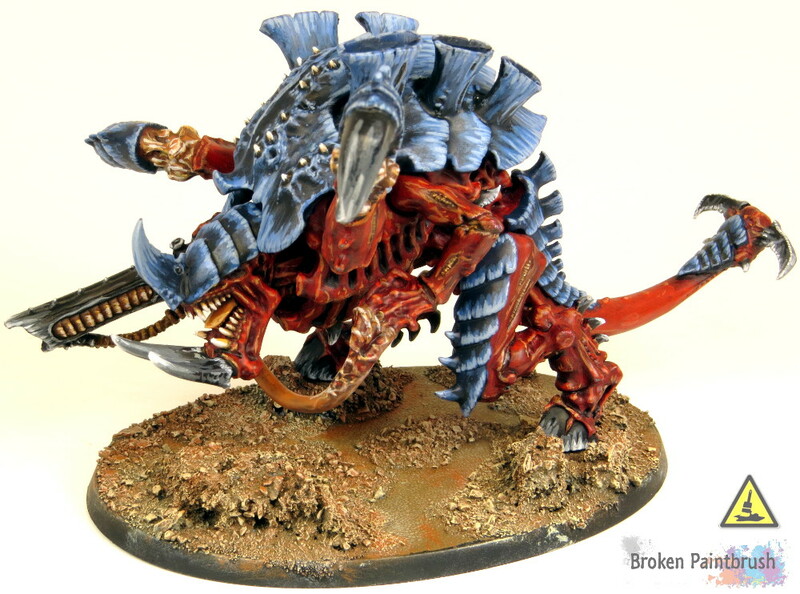 You can also see that I kept this beast off of his base because it can be so darn tricky to get those underbelly parts. So the feet have nails pinned in place and used half-corks to provide a working stand. 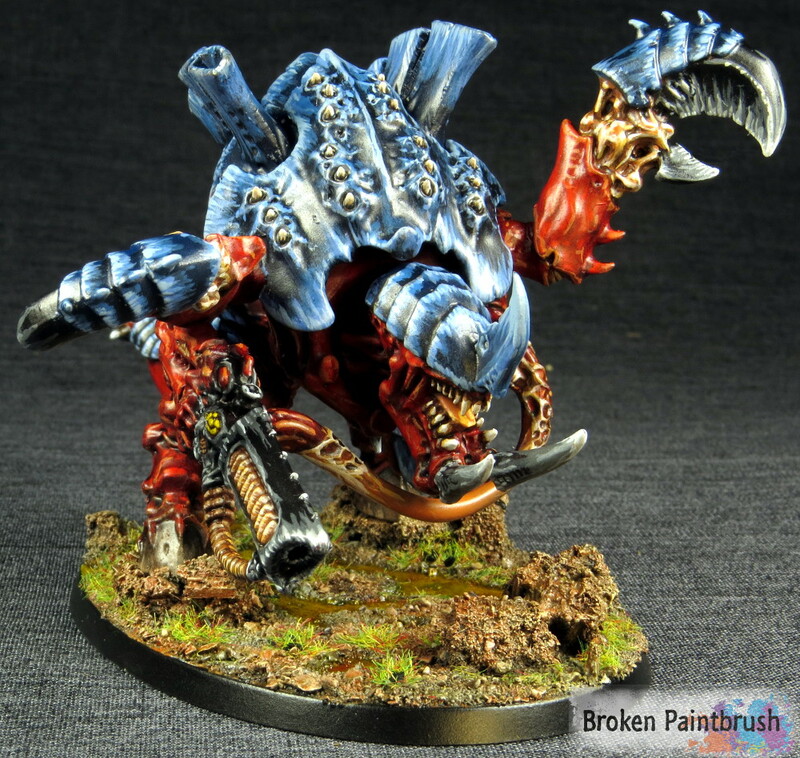 The base was painted separately (with a tutorial here). Here is why I love the blocking in technique: washes. I have been using Vallejo Dark Brown [Amazon] and am loving it. For some, this could be considered game-ready with maybe just a few of the remaining steps. 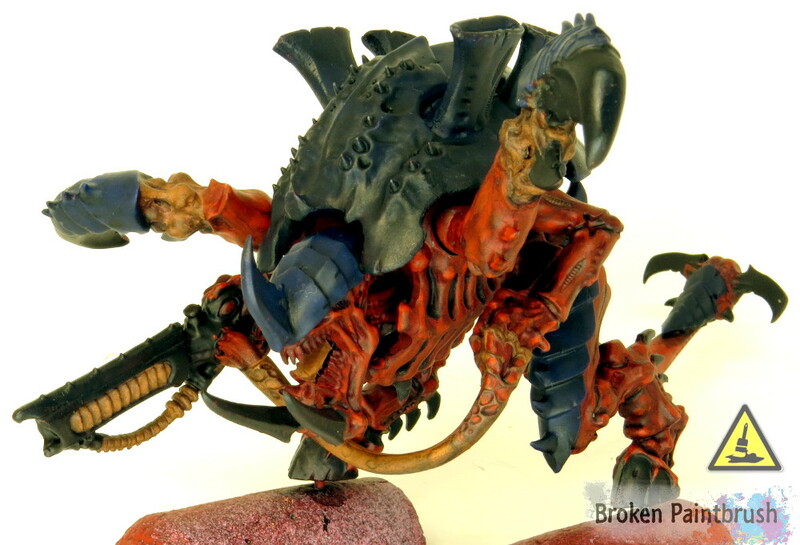 I also did a follow-on wash of black over the carapace to darken it a bit more. I then started working on the red using Evil Sunz Scarlet to create the first layer of highlights. This also cleans up the wash a bit as it does tend to pool at times. 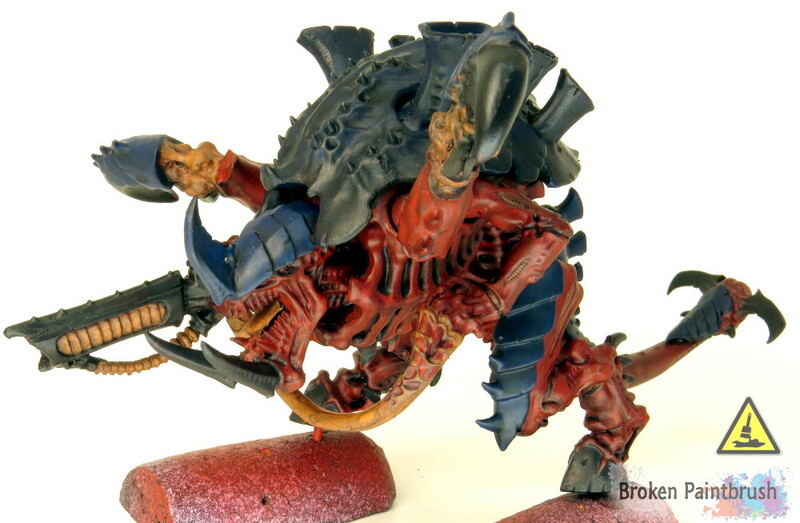 I then did a final highlight of Ratskin Flesh for the red to create a strong contrast. When highlighting red it is much better to move to more fleshy colors rather than trying to add white; it just moves it towards pink. While I had the Ratskin out, I went back over the lighter flesh areas to re-create the base color, leaving the darker shades in the recesses. Ungor Flesh was then used to highlight flesh areas. I also used it for the first layer of the teeth as well as the vent areas of the red skin. I then used Pallid Wych Flesh to do a final highlight on the flesh. This creates a nice strong contrast to the dark red around it. Not shown here is the final step of doing some back-lining of dark brown wash only in the recesses. This was especially important around the teeth and venting, but I also used it where the light flesh meets the more shaded areas to create more separation. 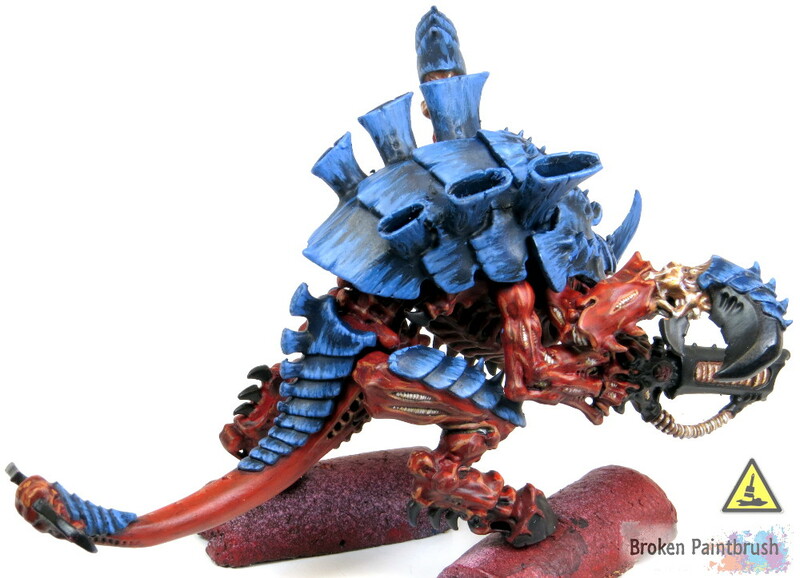 I then started working on the blue highlights of the carapace. The first layer was Caledor Sky. You’ll notice that here I am no longer doing edge highlights or any blending, but rather more of a sharp streak. 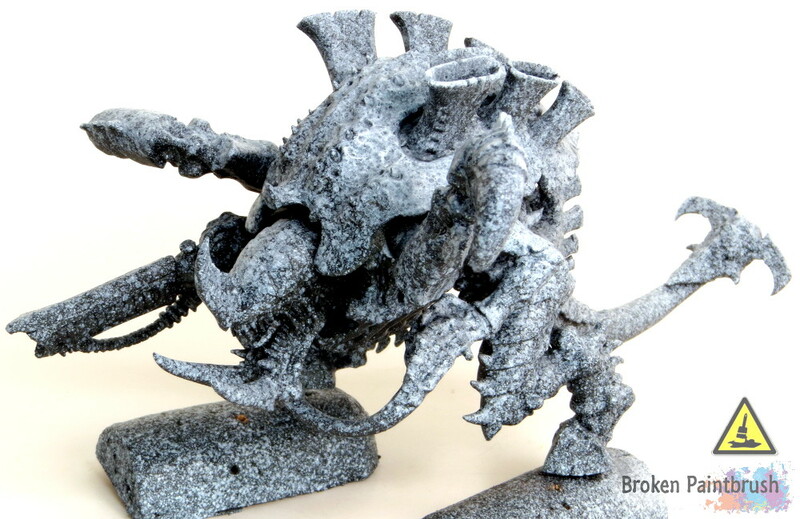 This is to create a beetle-like look on the hard armor. 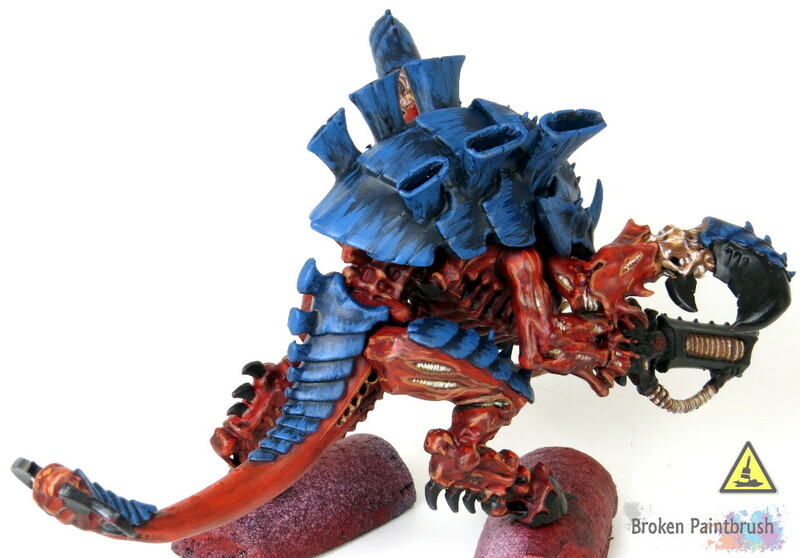 The second layer of blue highlights used Calgar Blue. Again keeping with more a streak look and kept inside the Caledor layer. The streaks were done by starting the brush against the edge and pulling it towards the inside edge, tapering along the way. The sharp highlight on the blue used Fernisian Grey and was kept mostly towards the sharp edges. On the Hive Tyrant, I applied a final layer of full-on white but decided not to go so extreme on the non-character model here. The weapons were given their first highlight of Mechanicus Standard Grey. These are done similar to the blue with some streaks but also using a bit of an edge highlight here as well. Applied next on the black was Administratum Grey, again mostly on the edges and shorter streaks. The final black layer is a small amount of Ceramite White along the hard edges. 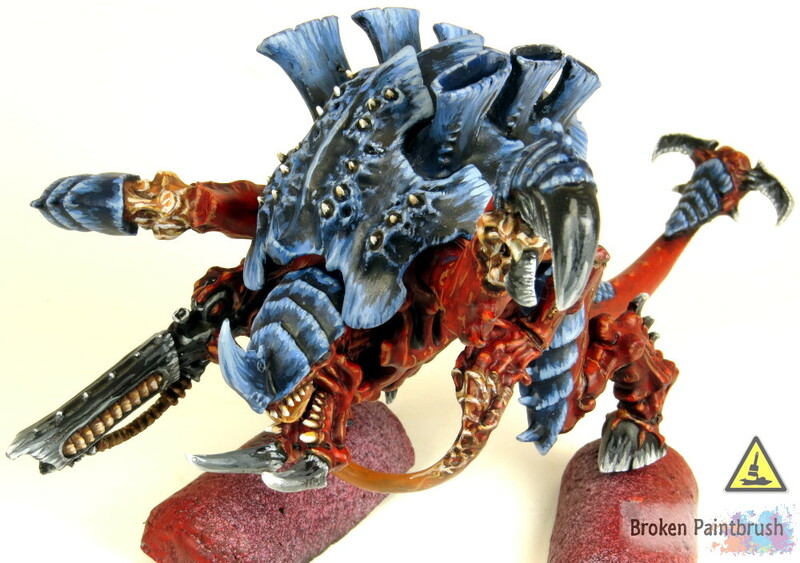 I also placed the Carnifex on the WIP base to see how it is coming together. The base had holes drilled to allow the nails to fit through with some extra plastic card underneath for additional support. Yriel Yellow was used for the base coat of the eyes as it has a good coverage factor. I then added Flash Gitz Yellow as I like the look better as it’s much more vibrant. The Vallejo Dark Brown Wash was again used to back line in the eye rim and between the weapon’s eye nodes. I also used the wash to add a tiny sliver down the center of the eye to create an iris. 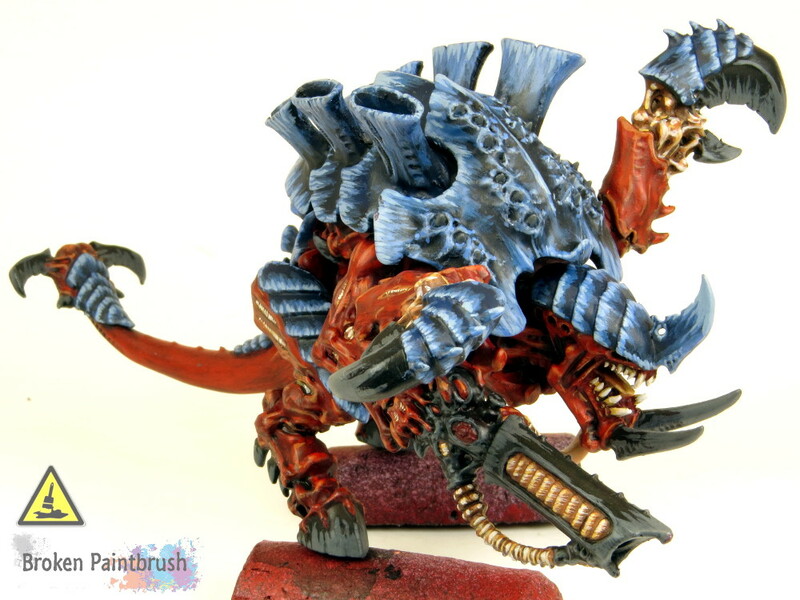 Some of the final steps included going back to the carapace spines and painting them as the teeth as well as touch ups to the blue and reds where the brush nicked the wrong color. The base was also completed separately and then glued in place. 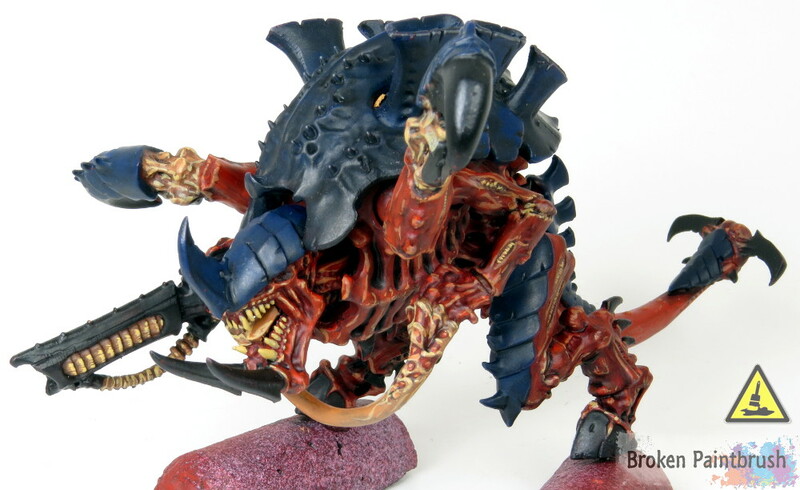 I hope you enjoyed my tutorial on how to paint a Carnifex if you want to check out more of my tutorials, click the ‘Tutorials’ link at the top. Next PostDecurion Detachments for All – Good or Bad?